These russet potatoes are not cheesed or buttered up. 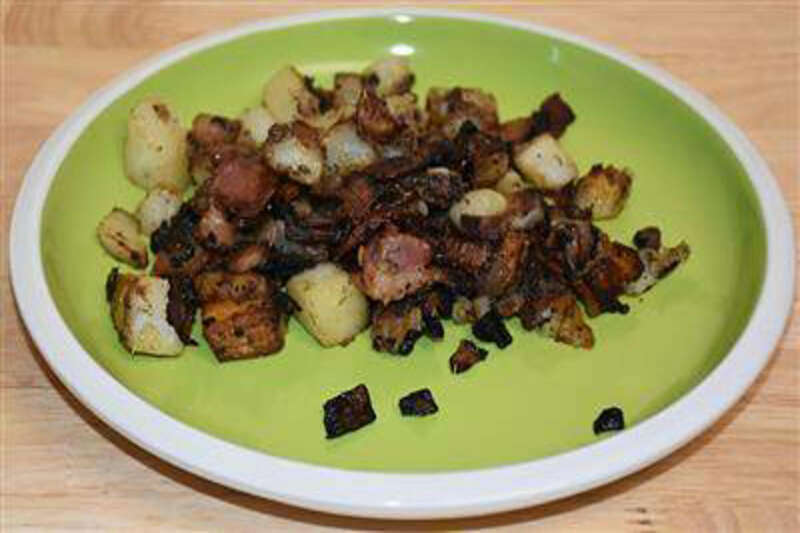 Rather, a milder, more succinct pairing with bacon, garlic, salt, and pepper does a better job at bringing out rich flavors and textures, without the need to use dairy products to moisten the potato. Swap for sweet potato to make it Paleo friendly. RecipeSavants.com These russet potatoes are not cheesed or buttered up. Rather, a milder, more succinct pairing with bacon, garlic, salt, and pepper does a better job at bringing out rich flavors and textures, without the need to use dairy products to moisten the potato. Swap for sweet potato to make it Paleo friendly. Smart Recipes, American Recipes, Pork Recipes, Recipes Pork American Bacon Fried Potatoes PT55M Serves 4 Ingredients: 4 Slices Bacon 3 Medium Russet Potatoes 1 Clove Garlic 0.25 Teaspoon Salt 0.25 Teaspoon Black Pepper 2 Tablespoons Thyme Heat a large skillet over medium heat and add bacon. Cook about 10-12 minutes while stirring occasionally. Remove the bacon and let them drain on paper towels. Add the potatoes, garlic, salt and pepper to the pan and cook 20-25 minutes, stirring frequently. Add in the thyme and bacon then cook for another 5 minutes.